When you’ve been around education for any length of time, you become aware that even the education field is not immune from trends. Instead of hemlines or lapel sizes, ours tend to focus on subject matter or techniques. Project Learning anyone? STEM? STEAM? Who remembers when we used to teach civics? Guess what-we’re teaching it again. Phonics or whole reading is now phonics AND whole reading despite the factions that fight on. Let’s just hope that open classrooms don’t come back, or did they already in the concept of the learning commons? Lately, social-emotional learning (SEL) seems to be making the rounds. Social-emotional learning as defined by the Collaborative for Academic, Social and Emotional Learning as the “process through which children and adults understand and manage emotions, set and achieve positive goals, feel and show empathy for others, establish and maintain positive relationships, and make responsible decisions.” https://casel.org/what-is-sel/. Whether we look at it as ‘one more thing to do’ or a tool for classroom management, the fact is that school librarians have been teaching SEL since we’ve had librarians in school! The history of children’s literature abounds in examples of social and emotional learning. When a culture tells a story, the teaching stick in the collective memories. Fairy tales and Bible stories (unedited) may be a bit much for younger audiences nowadays, but even their tamer renditions can help children see how decisions create consequences without having to take action themselves. We all know that talking to strangers and tarrying in the woods may result in bad things happening! Stories help us learn about how the we fit in the world and how the world fits in ourselves. Let’s take a look at our collections. 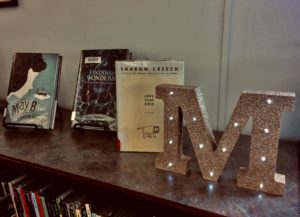 The stories found in non-fiction abounds through memoirs, biographies and scientific texts (on many reading levels) to help build students’ knowledge about managing emotions, making good decisions and how to create nourishing relationships. Fiction has long been recognized as a way to develop empathy, even with populations or creatures that we may never meet in person. When we and our students read a well-written story, we automatically put a piece of ourselves in the shoes of the other. While there are limitations (I’ll never be a wizard no matter how much I wish it! ), I can see what it’s like when nobody wants to believe what I’m saying as well as realizing that there are times when we misjudge the actions of those close to us. While longer texts can be used in SEL, the picture book has long been a librarian’s tool of choice in expanding a child’s social-emotional learning. 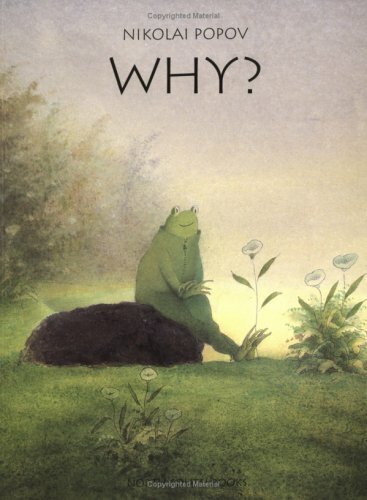 As librarians, we often choose picture books to read to our students that reflect issues and ideas that are happening in their classroom and the world at large. If the school is emphasizing a specific character trait, we often use those books that reinforce that characteristic. As experts in children’s literature, our curation of books can help weed out those clunkers that contain obvious preaching. Children aren’t fooled by sanctimony and sermons. Stories that may not have an obvious right or wrong answer can be used as discussion openers, allowing for thoughtful classroom learning. 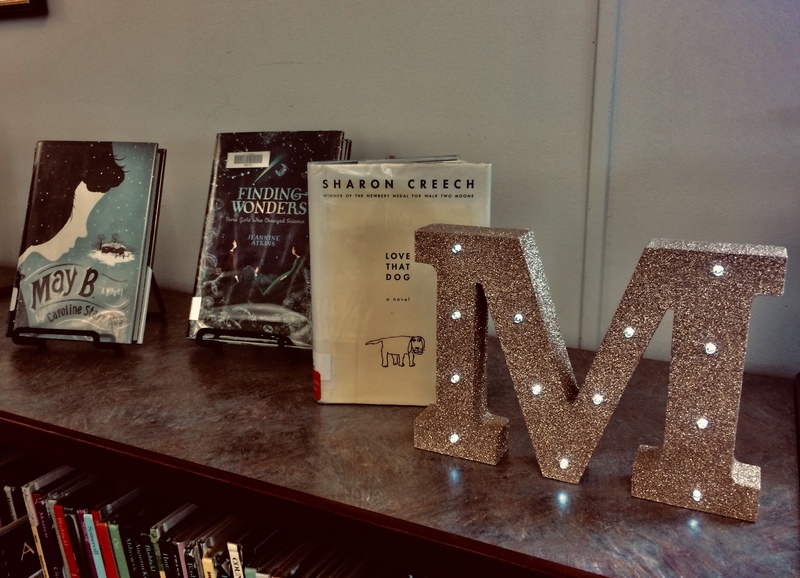 Below are some of the newest titles and a link to my pinterest board on SEL books that you might want to check out for your library. Once you start looking at some of your picture books through the lens of social emotional learning, you may want to create notes or a small database to help you find the right book for the right situation. 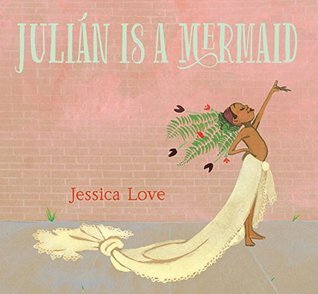 Julian is a Mermaid – Jessica Love. Julian is awed by three ‘mermaids’ on their way to the a seaside pageant. His desire to be like them results in using his Abela’s curtains and makeup to become just like them! This book shows us there is more than one way to be a little boy, especially when affirmed by those that are important in their lives. Me and My Fear – Francesca Sanna. At first, fear is a small fluffy friend that helps keep her safe. However, over time fear grows until it starts controlling what she can and can’t do. It is only once she finds that everyone has fears that she is able to learn to control her own. The Funeral – Matt James. An arty but realistic book on what the funeral experience might be like for young children. Even though she knows she should be sad, she can’t help but be delighted to be playing with her cousin or not going to school that day. Questions abound about the service and body but answers are left very open ended. Tiger vs. Nightmare – Emily Tetri. Tiger never had to worry about nightmares because her monster friend used to keep them away. One day a nightmare arrives that scares the monster! It’s only after they problem solve that the two are able to come up with a solution that defeats the nightmare and allows them both to get a good night’s sleep. If I Had a Horse – Gianna Marino. Through simple language, watercolor and pencil, Marino uses the relationship between a horse and a young child to show that learning about and understanding others allows one to grow strong and brave. I Walk with Vanessa: a Story about a Simple Act of Kindness – Kerascoet. A wordless book that shows that bullying affects even those who witness the act. When a young girl sees the new girl get bullied, she is upset until she finds that she can act on the problem. Captain Starfish – Davina Bell. Alfie gets anxious sometimes, even about things he wants to do – like participate in a parade. With strong parental support, Alfie realizes his spirit animal may be more like a clown fish who comes out of hiding now and then. Learning, casel.org/what-is-sel/. Accessed 8 Feb. 2019. Wordless books can be a librarian’s secret weapon for having a raucous story time! Students vie to give their interpretations to what happened, what IS happening and what is about to happen. Amidst the controlled chaos, wondrous learning is occuring. Students are comprehending the story by inferring from the picture clues. Predictions of what comes next spout as each one defends their choice by citing evidence from the pages. The why’s and where’s spotlight their oral language skills. All from a book with pictures – and no words. Sounds like they have mastered some of the Common Core Standards for ELA, all while having fun with a story. Jim Trelease, author of The Read-Aloud Handbook, states that, “Wordless books are a wonderful introduction to books and plotting for children who can’t read yet. Since we become picture-literate before we become print-literate, they can “read” the book if someone helps blaze a trail through the narrative initially. After hearing the book and seeing how the clues for the narrative are all in the pictures/illustrations, the child can pretend to read, though in fact they are taking real steps in reading…” (qtd. In Levin).They can convey the plot line to younger students or siblings while they practice essential pre-reading skills. Students can experience success with a book, even when they do not have solid text reading skills. Wordless books are not just for Kindergarten or Preschool students. Strong visual literacy skills not only help students learn to read text, but also ‘read’ other visual presentations of information in their lives. Pictures, video and infographics depend on their readers to have strong visual literacy in order to tell the full story (easter eggs anyone?). Wordless books can be used as opportunities to discuss current events and difficult issues. 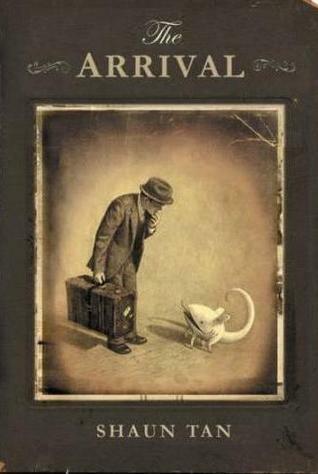 In Shaun Tan’s Arrival, one is drawn into the experience of being an immigrant, where everything is so different and strange when you arrive into a new country. How else could we experience that without being an immigrant ourselves except by going through it with the main character? The 48 pages in Unspoken: A Story from the Underground Railroad by Henry Cole would take more pages than that to unpack all that occurs. What should determine the right thing to do, my conscience or my culture? Why? By Nikolai Popov should be required reading for anyone who studies war or has their fingers near the button. Depending upon the time you have for library instruction, there are many ways to use wordless books. When using them for story time, it’s important that you ask the students questions, like ‘what is happening in this picture? What makes you think that? What do you think happens next?’ Unlike some other picture books, wordless books are works of collaboration between the illustrator, you and the readers. For station work or for group work, you might print several pages of a wordless book and have the student draw either what came before or what comes next after the series of pictures. Using comic strip graphic organizers, students can create their own ‘wordless book’ with guide words on top like ‘beginning, middle and end’. Some of the aforementioned wordless books with older students can be used as catalysts for discussions or writings about current events. Asking students to create alternative endings or using images to express their own opinions about subjects may make those students that aren’t as successful within the written realm to express themselves fully with images and pictures. With so many upsides I’m sure you’ll be adding wordless books to your library routine soon. Following are short descriptions of some of my favorite (and the Caldecott committee as well!) wordless stories. Enjoy! Tuesday, Flotsam, Section 7, Mr. Wuffles ,etc. 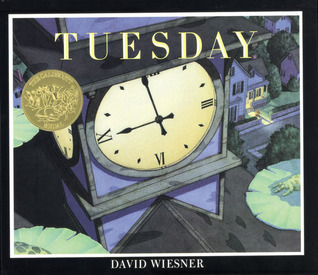 – David Wiesner. With three Caldecotts and two honors to his name, Wiesner is the king of illustrators. I LOVE to use Tuesday with K-1’s because the humor and whimsy is side-splitting. After the spectacle of flying frogs on one Tuesday, when the students see the last page of the next flying animal, I always hear several go, Ohhhh, Noooo! And giggle. What is better than that? One could do an entire author/illustrator unit of several weeks just using his work. 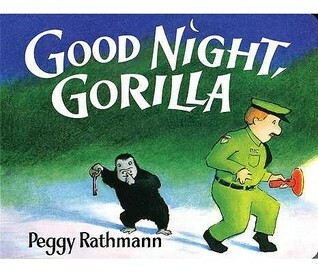 Good Night, Gorilla – Peggy Rathman. I buy this board book for anyone in my acquaintance that is having a baby. The look on all of the animals faces when they are discovered in the bedroom will make any adult laugh out loud. Teamed with Rathman’s 10 Minutes to Bedtime, you have a themed story time that every child will relate with. If you use Peggy Rathman’s website’s http://www.hamstertours.com/ in a station or with the group, your students will think you too are powered by hamsters! 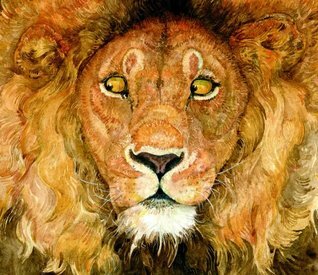 The Lion and the Mouse – Jerry Pinkney. This 2010 Caldecott winner can only be described as luscious. The story of how even the small can help the mighty resonates with young children. Don’t forget his equally incredible The Tortoise & the Hare. 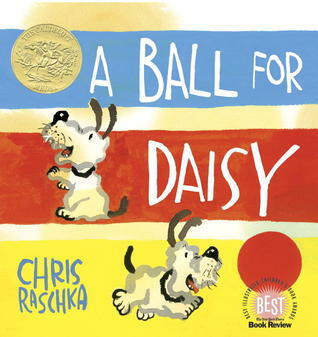 A Ball for Daisy – Chris Rascha. Students can relate to Daisy who is so happy with her favorite toy, a ball and is devastated when that ball is destroyed by another dog. Conversations about how to be a good friend and why it’s okay to be sad sometimes flow naturally from this story. 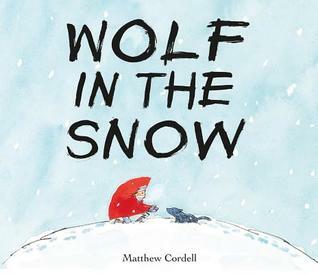 A Wolf in the Snow – Matthew Cordell. Last year’s Caldecott Winner displays unlikely friends helping each other when they find themselves lost from their pack (or people). Notice how many of these wordless books are Caldecott winners or honor books? Hmmmm. 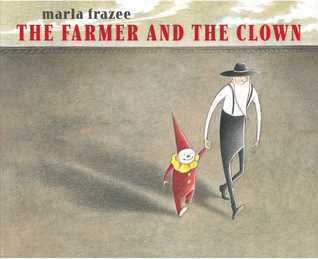 The Farmer and the Clown – Marla Frazee. A little clown is separated from his clown family. A grumpy old farmer takes him in. Just as the two become firm friends, the clown family returns. For some reason, this one makes me tear up. Humans being beautiful to each other does that. 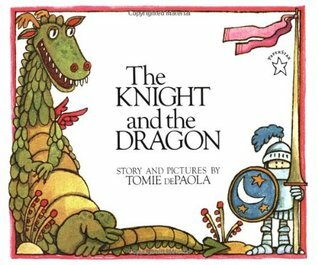 The Knight and the Dragon – Tomie dePaola (and his Pancakes for Breakfast)! The knight has a problem. The dragon has a problem. Who can help solve their problems? Well, let’s try the librarian princess. Yes, this one has some words (Pancakes does not). But together, they are a great little unit on how to solve problems – and one features a librarian. Seriously, it doesn’t get better than that! 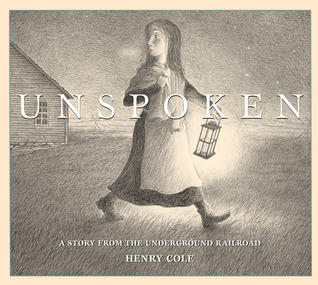 Unspoken – Henry Cole. A young girl discovers a runaway slave in her barn. What should she do? Her culture says one thing. What does her heart say? Especially useful for starting discussions about how to do what’s right when others (friends) may be pulling you to do what’s wrong. 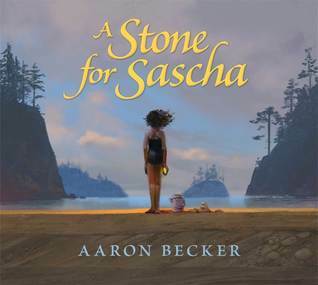 A Stone for Sascha – Aaron Becker. Another priceless work by Aaron Becker, author/illustrator of the wordless trilogy Journey, which also won a Caldecott Honor. 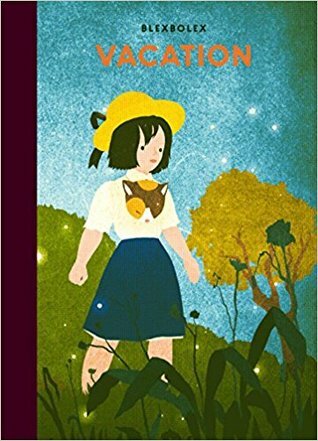 This 2018 picture book tells the story of a young girl whose dog has died, and she has to experience her vacation without her for the first time. A stone which arrived from space and has seen dinosaurs and civilizations come and go gives her comfort. More suitable for older students. Vacation – Blexbolex. You are having a lovely holiday with your grandfather and then he brings back from the train station… an elephant? How would you react? How would anyone reasonable react to an elephant spoiling the fun. The Arrival – Shaun Tan. A man’s country is overwhelmed by monsters. He must leave his family and everything he knows behind to try and make a new home for his family in a country where he can’t communicate and all is strange. Using fantastical creatures and symbols to convey the disorientation one experiences in a new place is genius. Why? Nikolai Popov. A frog sits on a rock, enjoying the day and minding his own business. Suddenly, he is attacked by a mouse wielding an umbrella. Soon a minor scuffle becomes a all-out war. Why? Be prepared for discussions of big issues. Kelly Depin is the Director of Libraries and Technology at Derby Academy in Hingham, MA. Derby Academy (Prek-8) was established in 1784 and is one of the oldest continuous co-educational institutions in the United States. Levin, Vanessa. “Jim Trelease: Wordless Picture Books.” Pre-K Pages, 20 Feb. 2018, www.pre-kpages.com/jim-trelease-wordless-picture-books/. Creator:National Gallery of Art, Young Girl Reading painted by Jean Honore Fragonard c. 1769. 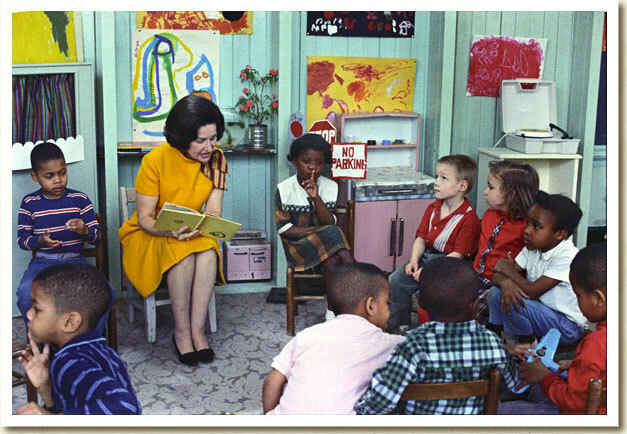 Photograph, Lady Bird Johnson Visiting a Project Head Start Classroom, March 19, 1966. Johnson White House Photographs from the National Archives, White House Photo Office Collection identifer #596401. At the end of the school year, I find that I’ve made lists upon lists upon lists of the projects I want to do during the summer: tweak the scope and sequence; create new videos and games for library instruction; learn new apps and smash them to bits; read my way through lists of the best so far this year; and on and on and on. I love my job. I want to do it to the best of my ability. But I have finally realized that if I don’t take some time to recharge my batteries, I will limp along to the beginning of the next school year, no more refreshed than when I ended. If you will bear with me, I’d like to present several ‘finds’ I use to energize myself over my summer break. As Abraham Lincoln noted, “…If I did not laugh, I should die.” I have several comedies queued up on Netflix, some great funny reads in my pile, and a few dates with friends stamped in my calendar. I find a good belly laugh at least once a day during the summer feeds me. What tickles your funny bone? National Geographic and NASA Instagram feeds showcase some of the most amazing photography available. I also subscribe to several authors that showcase work in progress, making me feel part of their creative process. Spending time outside everyday is important, even if it’s just watching clouds as they go by, or enjoying the lightshow of ladybugs. If you’re lucky enough to have a beach or a creek bank near you, spending time just watching the water burble pass or crash on a shore allows wonder to come to the surface. For me, wonder is awareness with gratitude. It can be found in nature or in the kindness we show to strangers. Keeping an ever watchful eye out for instances of wonder feeds me for when I feel life flows too fast. These are ways that I find wonder. How do you find it? Can you be more intentional in finding wonder in the midst of this human comedy? Here we see the spectacular cosmic pairing of the star Hen 2-427 — more commonly known as WR 124 — and the nebula M1-67 which surrounds it. Both objects, captured here by the NASA/ESA Hubble Space Telescope are found in the constellation of Sagittarius and lie 15 000 light-years away. The star Hen 2-427 shines brightly at the very centre of this explosive image and around the hot clumps of gas are ejected into space at over 150 000 kilometres per hour. 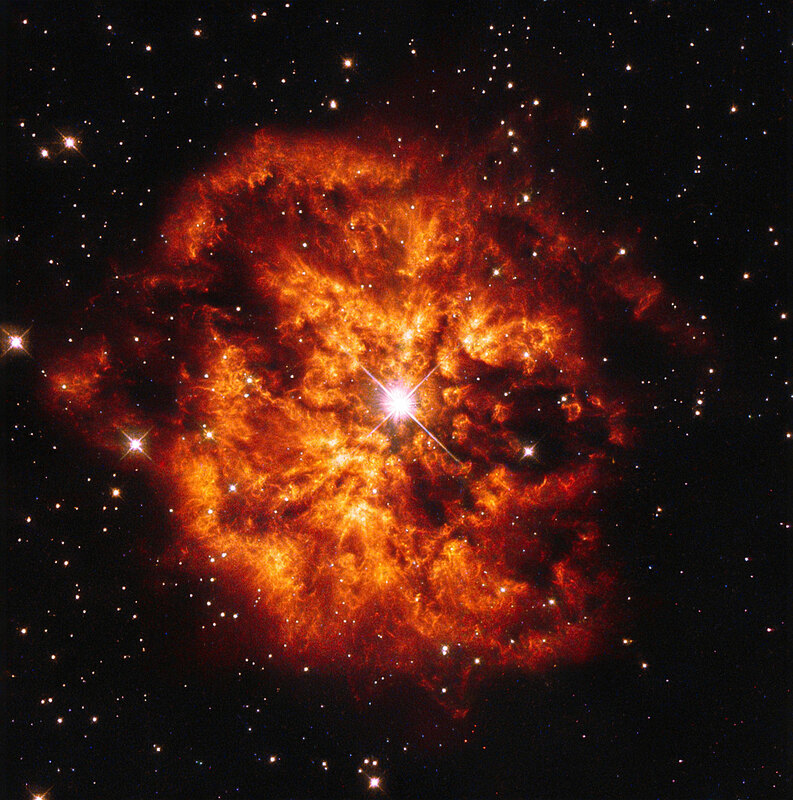 Hen 2-427 is a Wolf–Rayet star, named after the astronomers Charles Wolf and Georges Rayet. 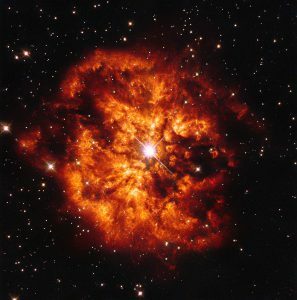 Wolf–Rayet are super-hot stars characterised by a fierce ejection of mass. The nebula M1-67 is estimated to be no more than 10 000 years old — just a baby in astronomical terms — but what a beautiful and magnificent sight it makes. A version of this image was released in 1998, but has now been re-reduced with the latest software. Summer is the time when I let my curiosity freak fly. Pinterest. How many times have you climbed into that platform only to discover an hour has flown by? Now’s the season to indulge yourself with no guilt. You can follow those pins to where ever your curious mind wanders. Bookstores? My phone is out and snapping pictures of books and displays. Bonus points if there’s a bookstore mascot of the animal variety. Public Libraries. Busman’s holiday! I may not be able to take any books out but I can peruse their shelves, check out the signage, grab promotional literature and check out programs. Summer is the time to explore interests that you may subjugate during the school year. A friend of mine decided to try woodworking with no previous experience. A beautiful mixed wood cutting board was her reward. Where will your curiosity lead you? Sometimes the best way to find something is to stop looking for it. I find when I fill myself with humor, curiosity and wonder, important projects get the energy they need to progress and the warm breezes of summer blow away the busy work that filled my in box. Have a wonderful, restful summer full of humor, curiosity and wonder.